Good luck unsubscribing from email newsletters sent by Best Buy and Hertz. As the below video elaborates, when your email address (that receives the newsletters) is not recognized as a valid address, a failure occurs. Let this be a lesson to email marketing companies. If you provide a means for a recipient to unsubscribe, don’t make the process difficult and ensure the address is in your database for prompt removal. Shameless plug: To receive best practices on new and emerging media and how nonprofit and public sector organizations are communicating effectively, please sign up for my newsletter here. The fact is when you ask someone to give you something, you get it. You are rarely asked to repeat your question. If the butcher doesn’t ask you to confirm you want a slab of meat, why are you asked to confirm you want to get emails? The answer is to prevent spam. 1. While it does not eliminate them completely, confirmed opt in reduces the probability of spam complaints, because someone with access to the email account has had to click a link specific to them. The confirmation process will help to ensure that people are only subscribed with their clear consent. 2. You will have a cleaner list because people have to use their real email addresses in order to confirm their subscriptions. This also eliminates misspelled addresses and typos. 3. Potentially more responsive subscribers. Those who are genuinely interested enough to confirm their subscriptions may also be more inclined to respond to your campaign or newsletter. Paul Cunningham is among those who agree with the email marketing mantra of always asking potential email newsletter subscribers for confirmation. Siding with him are Michael Martine (who shares a useful resource on email marketing) and David Risley (who writes these tips to improve email marketing), to name two respected bloggers. DJ Waldow is in a different camp that disagrees. He is explicit that you should stop when someone says yes. Who’s right? Or, is David Fredrickson on the money that neither system is best and both asking for confirmation and not asking for confirmation should simultaneously be used? The jury’s out. Share your comments below. In the meantime, I welcome you to sign up for my email newsletter. You’ll receive a new edition every month full of best practices on deploying new and emerging media. Habitually on the receiving end of more press releases than I care about, such as what Presswire sent me today, I followed their directions at the bottom of the email message to unsubscribe. To unsubscribe from receiving Presswire Press Releases, please reply to this email with UNSUBSCRIBE as the Subject. I wonder how many other people received the bounced email. This video is a follow-up to why your email messages assume too much. Stop assuming your reader is the same person. Stop cutting and pasting your reader’s name with your boilerplate templates. Stop treating these emails you send as quotas to meet every day. Start imagining you are the reader. Start asking yourself if you want to receive a cut and paste job. Start promoting your company, your product, your whatever. Start treating me like a human being and I will gladly reciprocate. Companies frequently email me to write about their products. Why do companies assume that I will be able to write about their product better than they? Shouldn’t I be a customer first, reviewer second? How about offering a $100 discount to sample your product risk-free? Email can sink your time so it is crucial you are in control. Here are 5 sure-fire ways you can be productive with email. 1. Create folders and filters. Every email program since the dawn of computers has allowed for folders and filters. The purpose of a folder is to store messages. The purpose of a filter is to automatically move incoming messages to a folder. How many of each do you employ today? Using descriptive folder names such as jobs, events, and dates, you can then move incoming messages that include specific keywords in the subject or body to your chosen folder. If you subscribe to mailing lists where the sender is always the same, create a filter with conditional logic that whenever a message coming from x@x.com arrives it is moved from your inbox to the x folder. 2. Reduce your inbox to zero messages every night. One of your folders to create should be for “to do” tasks. This is where every message that remains in your inbox every night should be manually moved before turning off your computer or going to sleep. About 12 months ago, I began practicing the habit of awaking in the morning to an inbox full of messages that weren’t there the prior night. Clearing your inbox is simple and involves two simple steps: create a folder and move everything in your inbox to that folder. Your goal every day is to cycle through the “to do” folder so it’s empty in case you need to move your inbox messages there. Failure causes that limbo folder’s messages to accumulate and cause unnecessary stress. 3. Control your urge to constantly check new emails. This GMail bookmarklet enables you to click the button in your browser whenever you want to send a message. A window will pop open to prompt you to fill-in your recipient’s address, write a subject line, write a body of content, and attach a file — and send the message without distractions of seeing or checking for new messages. Wouldn’t you rather click the “check new mail” button and see a message, rather than click it and see nothing because you previously clicked the button fifteen minutes earlier? If that email was urgent for your response, either you’d know of the email’s arrival or the sender would know how to reach you otherwise. And, for those of you who claim your nature of business doesn’t allow you to respond later, think of it this way: What if you were driven to the emergency room for a appendicitis surgery and couldn’t check email? Life goes on. 4. Unsubscribe to unnecessary commercial newsletters. It is common for marketing companies and brands to send you newsletters, coupons, and other forms of both solicited and unsolicited spam because you provided your email address somewhere online. This is not say you shouldn’t share your address but be cognizant that the terms of service of some websites allow your address to be shared with their partners. Commercial email in the United States is regulated by the federal CAN-SPAM Act which essentially says companies must identify themselves and they face penalties if they don’t offer you a way to unsubscribe efficiently. Unless you read those weekly or monthly commercial emails, why delete them every time when you can unsubscribe? 5. Review your spam folder now and then. If you opt to receive this blog by email, you will receive a confirmation email with a verification link to click. But that confirmation email sometimes is automatically moved to your spam folder for no reason other than the arbitrary rules of email providers. Ditto for other emails you may receive. If a friend or colleague asked you why you didn’t respond to such-and-such email message last week and you have no recollection receiving it and can’t find it in your folders, check the spam folder. Once you are satisfied with the amount of time you spend with email, head over to Dave Fleet’s blog and learn five more tips to reduce the volume of messages you receive, such as ceasing the urge to click ‘reply all’ and replying by other media if applicable. 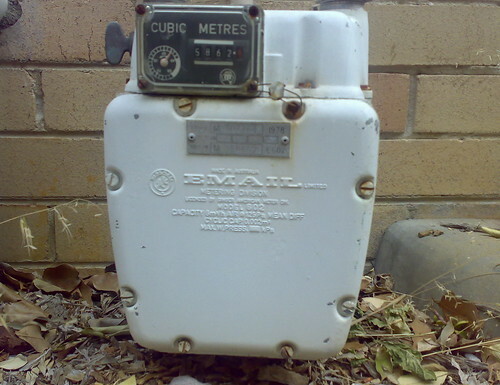 Do you like the photograph of a 1968 water meter by an Australian company called Email Limited? You can thank Tama Leaver on Flickr for it.